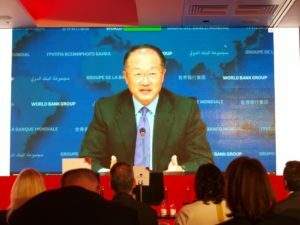 Large international corporations have a central role in global development and change, whether it is a question of economic growth or pollution or how the states try make them more attractive for big companies. This also includes the notion of corporate responsibility. There has been much discussion of late on sustainable development and socially justifiable conditions for employees. Workforce diversity is seen as a resource. More attention is being paid to fostering gender and ethnic diversity. In the last few years, more and more often discussion has focused on sexual orientation and gender diversity. 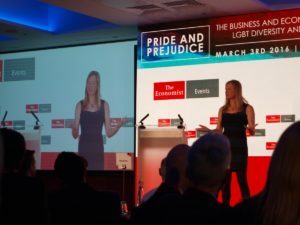 I recently took part in the Pride and Prejudice conference, which was organised by The Economist. The topic was the responsibility of large international corporations from the perspective of sexual and gender diversity. It took place on three continents. Corporate leaders, specialists, researchers and other participants met in Hong Kong, New York and London to focus on corporate responsibility and lesbian, gay, bisexual and trans issues from different regional and international perspectives. The companies present at the conference included IBM, Deutsche Bank, Microsoft, Facebook, L1 Energy, Shell and the Lufthansa Group. In London, research results were presented to demonstrate that advancing equality in relation to sexual and gender diversity is important from the standpoint of a growth in production. In practice, the results of such practices are most evident in recruiting and career development, in which the best actors not ignored because of discrimination. It will also benefit a company in terms of employee commitment and better work communities, ones which are more creative and minimise bad feelings among employees. It will also have an effect on clients and co-operative partners. Several experts also reported research findings on discrimination and how such discrimination makes it difficult for trans people and sexual minorities to advance in their careers. Discussion on the poor situation of trans people and the problems facing lesbians and gays belonging to ethnic minorities was quite animated. The importance of continued training and education as well as the advancing the visibility of diverse groups of people and introducing practical models for anti-discrimination were emphasised. Corporate leaders who had talked about their non-heterosexuality or norm-challenging gender identity were seen as positive models. Others emphasised the fact that receiving strong and visible support from the corporate leaders is important for diversity work. LGBT employee networks were seen as a useful tool. 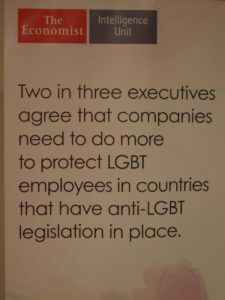 Many large companies find it challenging to work in a country where the legislation or human rights situation in general is negative for trans people or sexual minorities. Three possible strategies were presented in the conference. In the do as the Romans do model, the problems are not faced and the discriminatory practices are not questioned. In the embassy model, the company can work as a safe haven for LGBT employees, but it will not try to actively influence the general situation in a country. In the advocacy model, the company will try to actively or discreetly change the negative legislation and make decisions on where to invest by taking the LGBT human rights situation into account. Corporate leaders who took part in the London conference said that they understand all three strategies, but they emphasised the importance of corporate co-operation when working for change. No major Finnish companies were present at the conference, but the topic of diversity must be familiar to them. Legislation in Finland demands that companies take into account how to make the workplaces more equal and less discriminatory. It is time for Finnish companies to raise the bar in advancing equality and let others know what they have achieved in terms of diversifying the workplace. This would support others in doing the same. It is also time for large companies to openly promote the first lesbian and gay leaders: who will be the first one? Transgendered research director Vivienne Ming talked about research results on the costs of discrimination. The investigative unit for the Economist did a survey of 1021 leaders in 104 countries in 2015 on their attitudes towards lesbians, gays, bisexuals, and trans people.